Description: CSX #X464, Bridges street, 16:53 hrs. 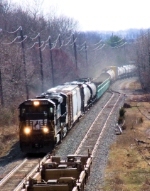 Description: Empty ethanol train heading south for interchange with CSX in Thomasville. Description: The Georgia & Florida crew parks the empty ethanol train on the Pelham wye. 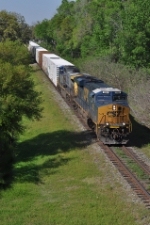 The train will head east to Waycross with a CSX crew. Description: Ready to head east! Description: Interesting clouds and two ES44ACs. Not very common around here. Description: Camp Meeting Ave., 1612 hours. South/West end of Skillman Siding, CSX Trenton Line. Description: 4 units on Q418 approaching Yardley station. Description: Approaching Sandy Pond Rd. Description: POSE takes the turn at Ayer. Description: Just ahead of the rain! Description: CSX train Q741, TPIX empties, passes through Dade City on former ACL trackage. Description: CSX ES44AC 884 leads Q573 (Cincinnati Oh. to Nashville Tn.) through Glendale.